Mr Nerd and I are at a stage when many of our friends are moving out of home, buying their first house or setting up home together. We have been going to quite a few house warming parties lately and there have been a few times where I have been completely stuck as to what to get for a gift! So I thought I would brainstorm some great house warming present ideas on here. 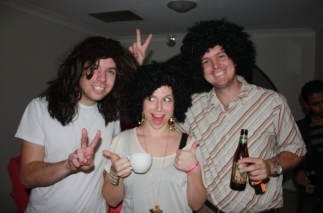 Skip to the end of the story if you want to see a few pics from our own 70s-themed housewarming party in tribute to the era The Crap Shack was built. IDEAL FOR: The friend with a dog who loves to kick back with a few beers (the friend, not the dog). We went to a party last night and friends of ours, Jess and Jonesy (who shamefully I still owe a housewarming gift) brought their puppies along. 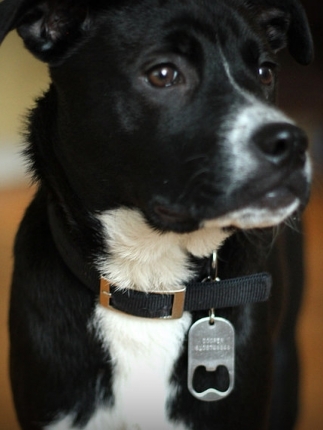 One of them (the dog, not Jess or Jonesy) was proudly wearing a metal tag on his collar. I realised that it was a beer bottle opener when Mr Nerd called the dog over and used him to open his beer (the dog looked quite proud. I think dogs like to feel useful). I thought this was such an awesome idea. 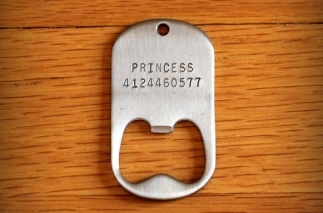 You can get these through Bark4Beer or you can get tag-style ones that have your dog’s name and phone number stamped on them through the Etsy store poptag for $16 a pop (get it? :D ) If your friend has one of those dogs that runs away when it's called, this present might be more upsetting than pleasing. ABOVE: He can't go to the bottle-o for you. But your canine friend can still be a useful drinking buddy - have him help you open your beer. Poptag on Etsy sell the silver tags and Bark4Beer sell the ones below that fit snugly into the collar. IDEAL FOR: The friend or couple who’s saying “Hello mortgage” for the first time. 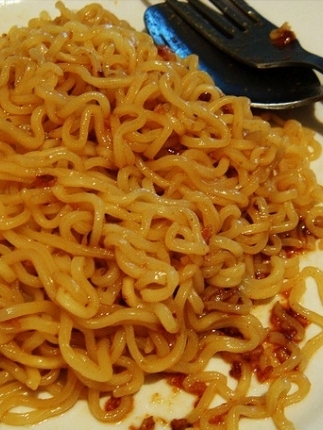 As a struggling uni student, I lived on Mi Goreng, as did many of my fellow wannabe writers. Thirty cents a packet? Bargain! MSG and sodium in a tidy packet with flavor sachets. As many of us know, Mi Goreng is THE staple food of the students, the penniless and many a first home owner who can’t afford to buy real food. 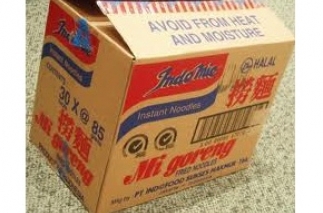 I’ve given a big box of Mi Goreng as a gag house warming gift a couple of times, beautifully wrapped of course with lovely ribbons spilling over the sides. Include a card. “Dear Carl, congratulations on your first home! Welcome to home ownership and mortgage repayments. Get used to eating this stuff.” You can get bulk boxes of Mi Goreng from Spud Shed and Asian food stores for around $8 to $15. ABOVE: My staple diet as a uni student - and a fantastic housewarming gift for the person who's just been saddled with a huge mortgage. By the way just in case you are not aware you should avoid from heat and moisture. IDEAL FOR: The cruisy friend who likes to kick back on their veranda with an icy Corona (and now has a veranda to kick back on with an icy Corona). I can’t take credit for this cute housewarming gift idea – I came across it while procrastinating on Pinterest one day from the lovely entertaining blog Après Fête. 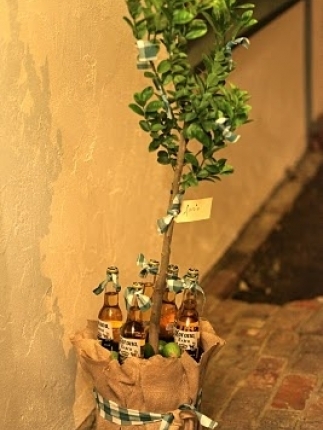 We all know you can’t drink a Corona without a wedge of lemon or lime – so why not give a carton of Coronas with a little citrus tree to go with it? Even if your friend doesn’t have a garden, citrus is known to do really well in large pots so they're great for a balcony, and most garden centres these days also sell mini fruit tree varieties. WANT A BEER? 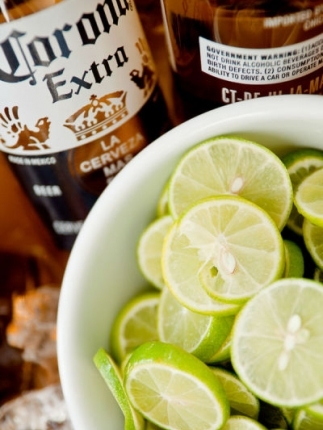 Coronas with a lime tree from the inspiring entertaining blog Après Fête. ABOVE RIGHT: Tasty Coronas. Photo by Ariel Nay. 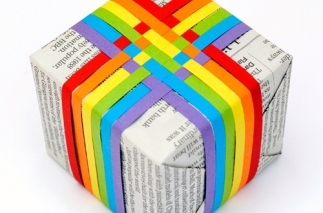 IDEAL FOR: A special present the giftee can keep for years and years. One of the best gifts we ever received was when we first moved into The Crap Shack . It was from Mr Nerd’s sister, who gave us a beautiful set of Laguiole cutlery made in France. 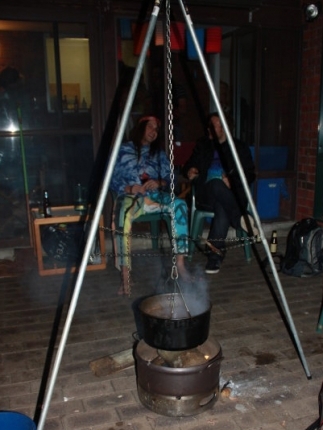 At a time when we were still using a hand-me-down pine coffee table from a family friend and making do with foldable camping chairs until we got a real dining set, it was the fanciest thing we own! (and possibly still is). Initially meant for “special occasions only” the cutlery was so nice to use we soon ended up using it every day – it makes eating even a bowl of stew on the couch feel a little fancy. 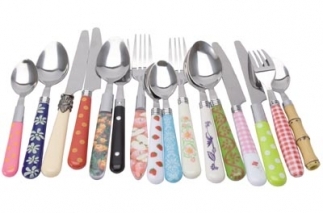 If you are after a really nice gift for someone, this cutlery is perfect. Just make sure you get the real deal. There are a lot of imitation Laguiole sets out there. Try Everten or eBay. If you are after a more low-cost cutlery alternative, I also own this Mix & Match Cutlery Set from Corner Store and love it. How cute is it? 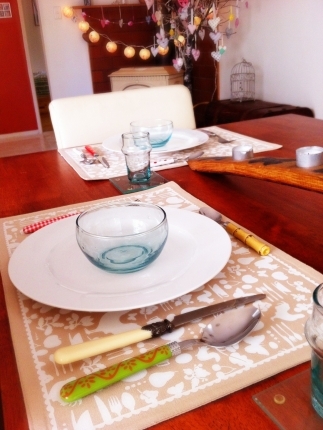 I love mismatching dining settings and it’s so colourful and cheerful! You just cannot eat from a quirky spoon covered in pictures of strawberries and be sad. And it would be perfect for throwing a Mad Hatter’s tea party. 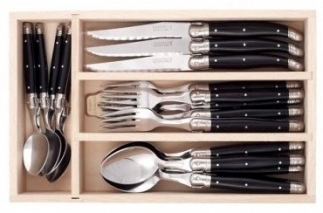 You can buy the cutlery set for $39.95 from Corner Store (they have a terrific online store too). ABOVE LEFT AND TOP RIGHT: I love my Mix 'n' Match Cutlery Set from Corner Store. In the background you can see our Easter tree. Not quite sure if it looks good or strange this year. UNDERNEATH: Gorgeous Laguiole cutlery set. These pieces feel as good as they look. IDEAL FOR: The family member who has bought their dream house. 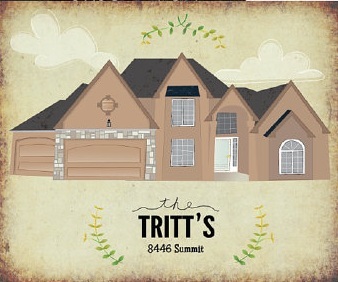 You might be clever enough to draw a house portrait yourself. Or you can utilise your best Facebook or realestate.com stalking skills instead to obtain a photo of your friend's new abode before checking out the virtual home decorating wonderland that is Etsy, where you will find heaps of talented artists can make you a gorgeous customised picture for a gift that will be kept forever, even if they move house. ABOVE: House portrait by Ashley Ella Design via Etsy. 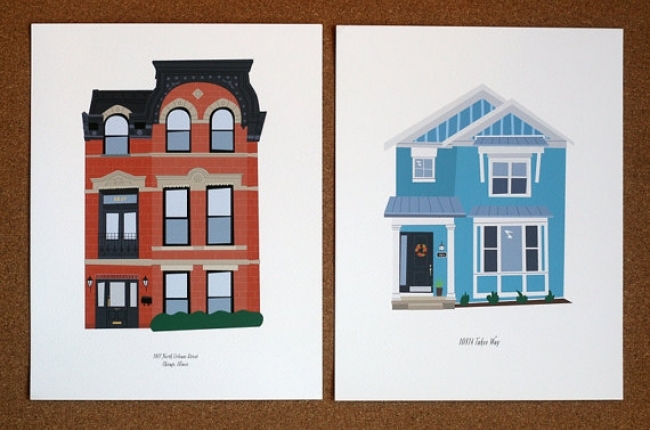 ABOVE: Lovely custom house portraits from HouseLoveShop on Etsy - this artist's custom works are so in-demand she has a waiting list. 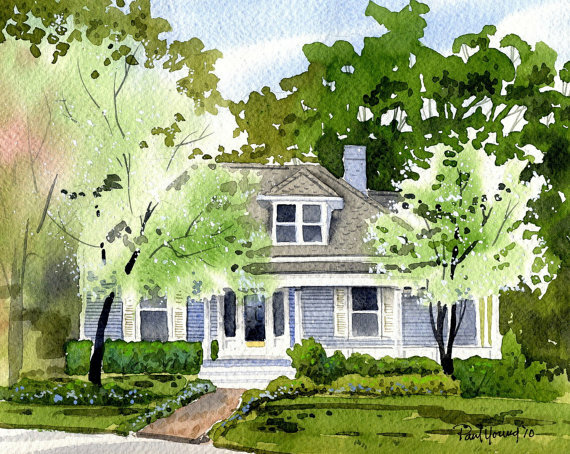 ABOVE: A gorgeous custom house watercolour from artworm on Etsy . IDEAL FOR: When you are a struggling student, dirt poor, or subsisting on Mi Goreng, and can’t afford an expensive present. I remember copping a bit of flak at a house party once when friends realised that my takeaway menu folder was categorised into sections like Japanese, Chinese, Fish & Chips, Italian, Burgers, Non-Italian Pizza. But can I just tell you how easy having a categorised takeaway folder makes things when you’re getting takeaway? Pick up a folder and tabs from Officeworks. IDEAL FOR: The friend who loves to cook. Okay, so it would be a little too girly for a guy friend. 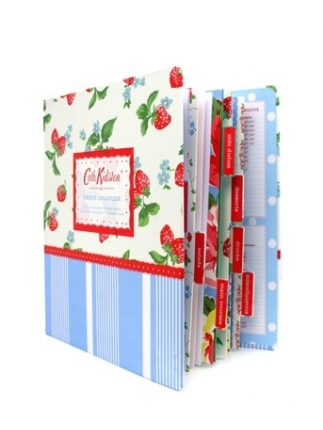 But for your girlfriends - how cute is this Cath Kidston Recipe Book? I have this and love it. I got it when I made a New Year’s resolution to try at least one new recipe a week (one of the only New Year’s resolutions I’ve actually kept). 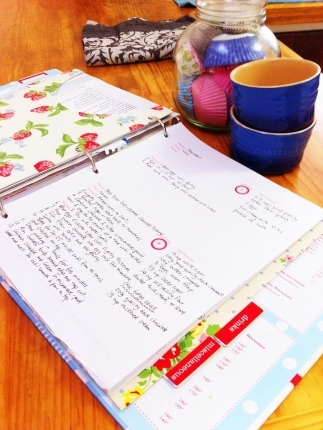 It has tabbed sections for all organising different kinds of recipes, cooking conversions and folders for magazine tear-outs. The only thing is that if you want to file pages torn from magazines you need a triple hole punch rather than a standard double punch. My book was $30 from a gift shop but you can order it online for cheaper through places like Bookworld and get free postage to boot. IDEAL FOR: The young person who’s moved out of home for the first time and still impresses all with their ability to burn water. I am all the smug cook now, but I barely touched a wooden spoon until I moved out of home (my mother hated me even being present in her kitchen). I soon realised that my lone signature recipe for a nasty spag bol just wasn’t cutting the mustard on a thrice-weekly basis. I needed this housewarming present more than anyone. When my youngest sister moves out of home I am going to make her a recipe book with all the really easy, cheap yet surprisingly tasty recipes I have learned since moving out of home (potatoes, beans and lentils will be staple ingredients). You can make this personal by getting everyone in your family to contribute a basic recipe. Like “Maya’s Easy Beans and Chorizo Sausage” or “Mi Goreng”. It will have basic recipe instructions like the below. Add flavor sachets and eat. Bloat up from sodium overload and panic when you realise your ring is now cutting off all circulation to your finger. IDEAL FOR: Just about anyone who cooks. Because cooking with fresh ingredients is always so nice and you can pretend you look like Nigella Lawson while doing so. 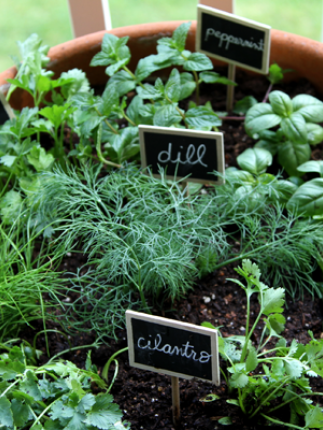 Even if your friend only has a balcony or a windowsill, that's all you need for a pot of herbs! Great herbs that are hardy and will last most of the year are oregano, thyme, perennial basil, and chives. ABOVE LEFT: Herbs in a pot photo from the gorgeous blog Black Eiffel. You can buy similar cute chalkboard stakes from Corner Store. 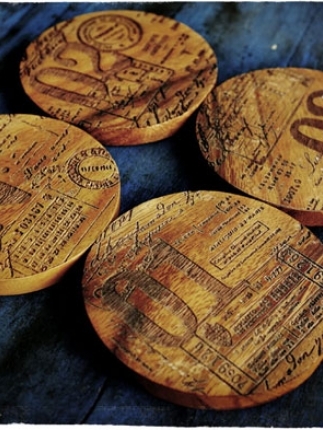 ABOVE RIGHT: Mr Cup coasters handcrafted in Bali. IDEAL FOR: A handcrafted, rustic present for the friend who likes the things in their home to be a little special. My friend Cat introduced me to the work of Mr Cup – aka Fabien Barral, the lovable designer behind the sweet blog Graphic Exchange, who travels and works between Thailand, Bali and his native France. I love his personal style and his work - and his hand crafted Suar Wood Coasters, made in Bali, would look pretty damn good on my coffee table! You can order them online (for me, if you like) for 25 euros. 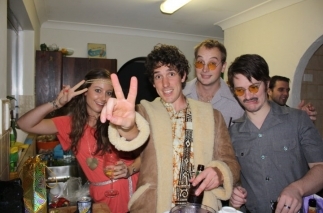 OUR OWN HOUSEWARMING PARTY: To celebrate the era The Crap Shack was built, when me and Mr Nerd moved into our house we had a 70s-themed housewarming (with fondue). As is apparent, I seemed to have gotten my eras mixed up and worn a dress that I now realise was more 60s than 70s. 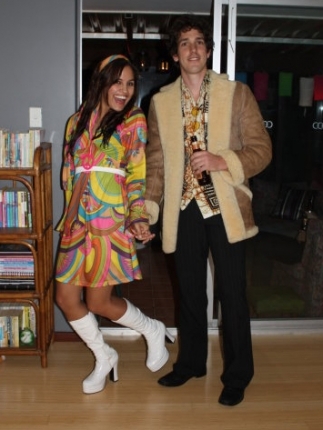 Maybe I could have passed for an fashion-challenged 70s person whose sense of style was stuck in the last decade. ABOVE: We hadn't touched our garden yet when we had our housewarming, so we were quite happy to make a mess of it! 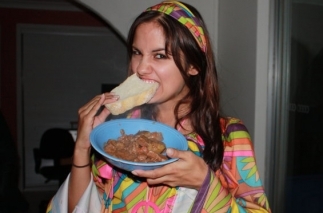 We slow-cooked a stew in a pot in the back garden and ate it at midnight with crusty bread. By then everyone was ravenous. OUR HORRIBLE SUNROOM: We also hadn't yet done our sunroom when we had our housewarming! How ugly was this room back then? 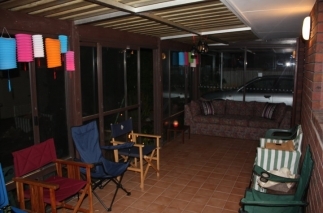 If you haven't read about our sunroom makeover yet you can see our 'after' pics here. We've given square white crockery before - not the most exciting gift I know but always practical! How about a gift certificate from us at My Bespoke Chair?! That way, they can design the chair themselves and get exactly what they want. :-) P.S Love reading about your own home, poetically named The Crap Shack. Very self-depricating! Mamma mia! You look so Jackie from That 70s Show in your get-up, so no, you don't appear to be a fashion-challenged person of that era! Also loving the Mi Goreng idea - seriously love it!! I might just have to steal it from you! If I were to get housewarming presents, I'd get some nice statement cushions, vintage teapot set (from markets, eh?? (:), DIY chalkboard frame for the kitchen or magnets for the fridge (cause I've come to realize I seriously need more of those). 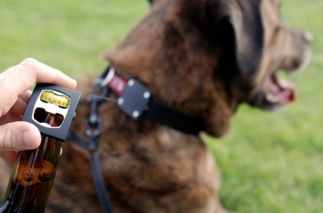 Dog collar bottle opener - genius. I'm ordering one for Milly immediately. Nala will loathe it but she's getting one too! Hmm do you think there'd be a niche for a corkscrew option for wine....? Great list! 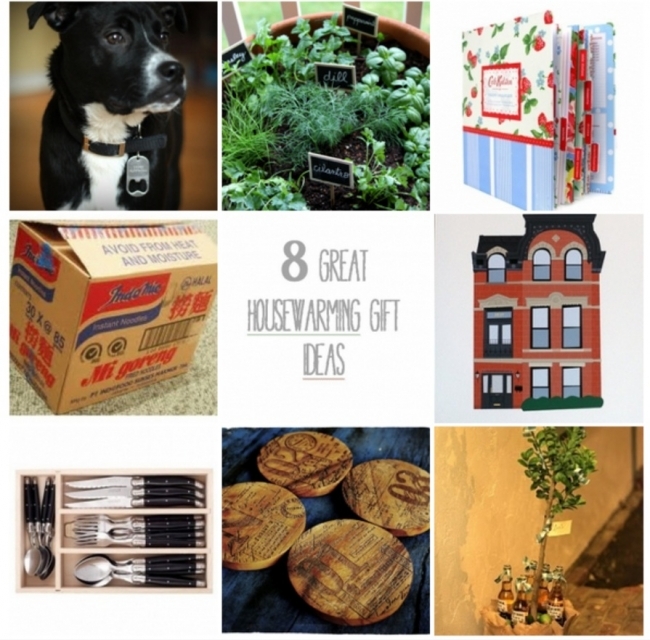 Here are more <a href=“http://wellgifted.co/best-house-warming-gifts/”>house warming gift ideas</a>!